Selfie. What a word. It became a thing as front-facing cameras on phones improved dramatically in recent years. Until now, the HTC Desire Eye has been one of the first that comes to mind in this category, but it's about to face a direct competitor that''s also from Taiwan. 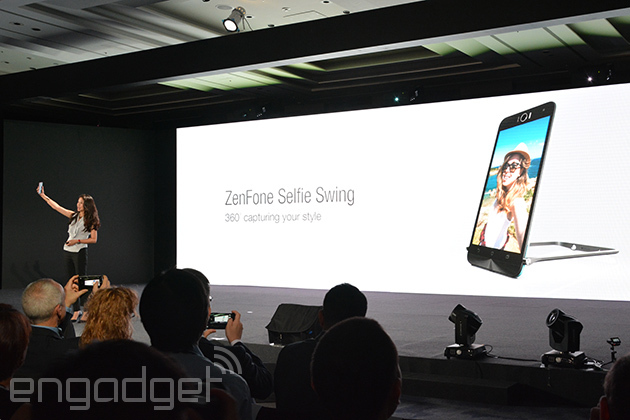 ASUS has just announced the ZenFone Selfie, which, as you can tell, is all about taking selfies. Both its front and rear cameras feature a 13-megapixel resolution and dual-tone flash, although only the main f/2.0 camera has fast and low-light-friendly laser autofocus (something that even the flagship ZenFone 2 lacks). That said, the front f/2.2 camera makes up for the loss with a wide 88-degree field of view, thus making it easier for group selfies ("wefies?"). The rest of this Android phone looks almost identical to the ZenFone 2. You get the same 5.5-inch 1080p LCD (but with tougher Gorilla Glass 4 instead of its predecessor), the same backside volume rocker and the same curved body for a comfortable grip. The less obvious change here is the processor: ASUS has opted for Qualcomm's mid-range, octa-core Snapdragon 615 over the chips from its close buddy, Intel. It's a pretty-looking phone, especially in the pastel colors. If you're used to 5.5-inch smartphones and your life revolves around your Selfie Game, you might want to keep an eye out for (eventual) release dates and pricing.